Markov chains are used primarily in Natural Language Processing for part-of-speech tagging. Corpora are studied to establish the construction of sentences. This is a very powerful algorithm that can also be used to generate new material (words, text, et cetera). In this first post I will talk about generating words. Given a corpus, letter patterns are studied at different depths. For depth one, the probability of a letter following another is established. For depth two the probability of a letter following a sequence of 2 letters is established. The same goes for greater depths. The result of all this studying is a table of probabilities defining the chances that letters follow given sequences of letters. 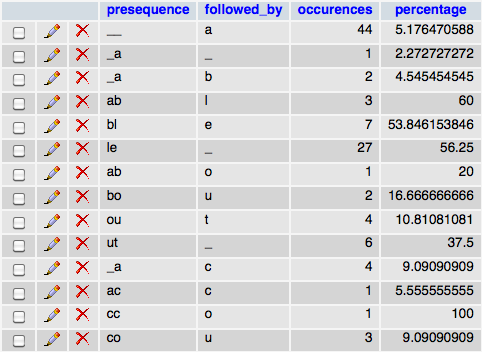 When the time comes to generate words, this table of probabilities is used. Say that we need to generate a word at depth 2, we seed the word with 2 null letters, then we look in the table for all the letters that can follow a sequence of 2 null letters and their associated probabilities. Their added probabilities will be 1 obviously. We generate a random number between 0 and 1 and use it to pick which following letter will be chosen. Let’s say that the letter “r” was chosen. Our generated word is now comprised of “null” and “r”. We now use this sequence as the basis for our next letter and look for the letters that can follow it. We keep going until an null letter is reached, signifying the end of the generated word. It will generate words that do not exist but respect the essence of the corpus it’s based on. This is really cool for example to generate words that sound English but aren’t (say for random passwords that can be pronounced/remembered). We could also make a list of all the cool words (motorcycle, sunglasses, racing, et cetera) and extract their essence to generate maybe a product name that is based on coolness :). I am very much interested with this algorithm because I would like to apply it to random music generation. It is possible to get the source code. I will translate it to C++. This algorithm can be used for a lot of things not just generation. I’ve generated words, texts & music with it. I’ve always wanted to see what images would look like but never got the time to work on it. At the end of the day I think it can be used for much more than that. Since it extracts the numerical essence of something I think it could be used in a unified and generic way to identify data. Meaning given a random sequence of bytes, are they arranged like language? like machine code? like encrypted data? like encrypted language? et cetera. Do you understand the concept of Markov chains to begin with? Yes I understand markov concept, all of it is based about a transition matrix. This matrix is builded using probabilities and after you generates an output based on it. While this is fine, it’s actually inferior in practice to the very reasonable process of breaking the words up at the vowel group, consonant group level. If you rather than the letters go by the vowel clusters it’s far superior. Link, not individual letters but rather individual sounds, though really we use vowel-clusters as they are basically the same thing. So “Hello” gets ^-H-e, e-ll-o, o-$ links as each group of consecutive vowels or consonants is 1 link in the chain. Typically C-V, or V-C-V or V-C word parts.